OXFORD, Miss. 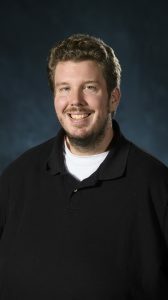 – Marc Watkins, an instructor in composition and rhetoric at the University of Mississippi, has been named the winner of the 2018 Blackboard Catalyst Award in the Teaching & Learning category, which honors those who have adopted flexible distance and online delivery, including using mobile technologies, to have a positive impact on the educational experience. Watkins is being recognized for demonstrating innovative use of the Blackboard platforms, increasing flexibility, furthering learner and instructor effectiveness and efficiency. Founded in 2005, the annual Catalyst Awards recognize and honor innovation and excellence in the Blackboard global community of practice, where millions of educators and learners work every day to redefine what is possible when leveraging technology. Winners are selected by a cross-functional team of Blackboard experts. Watkins used Open Educational Resources and new technology to modify his Writing 102 online Blackboard course to replace traditional textbooks and increase student engagement. Open Educational Resources reduce student expenses by eliminating or reducing textbook costs. He received grants from Z-Degree Mississippi and Academic Outreach (formerly called Online Design and eLearning) to develop an online resource through Lumen Learning and help students use innovative techniques to navigate digital spaces. “We are very pleased that his energy and commitment are being recognized through this award,” Monroe said. Watkins attended the University of Central Missouri as a nontraditional student, earning a GED diploma instead of a traditional high school diploma and attending community college before transferring to the four-year institution. He later received his Master of Fine Arts in creative writing from Texas State University and published award-winning fiction. He credits his experience as a nontraditional student with giving him insight into the struggles faced by many nontraditional first-year writing students. Watkins will be honored alongside other Blackboard Catalyst Award winners during BbWorld 2018, Blackboard’s annual user conference to be held July 16-19 in Orlando, Florida. For more information on the Blackboard Catalyst Awards, visit: https://community.blackboard.com/groups/catalystawards. The University of Mississippi, affectionately known as Ole Miss, is the state’s flagship university. Included in the elite group of R1: Doctoral Universities – Highest Research Activity by the Carnegie Classification, it has a long history of producing leaders in public service, academics and business. With nearly 24,000 students, Ole Miss is the state’s largest university and is ranked among the nation’s fastest-growing institutions. Its 16 academic divisions include a major medical school, nationally recognized schools of accountancy, law and pharmacy, and an Honors College acclaimed for a blend of academic rigor, experiential learning and opportunities for community action. Our mission is to partner with the global education community to enable learner and institutional success, leveraging innovative technologies and services. With an unmatched understanding of the world of the learner, the most comprehensive student-success solutions, and the greatest capacity for innovation, Blackboard is education’s partner in change.